Burgos is a city that lies on the river Arlanzon, about 210 kilometres north of Madrid. It is mostly famous for its Gothic cathedral, which dominates the old town. Burgos is the capital of the province of Burgos, which lies in the region of Castile and León. In 2008 the airport of Burgos (RGS) was opened to commercial flights. Until then it had been a military airport. At the moment Iberia has flights to Barcelona and Paris (Orly). Burgos is connected to the rest of the country by the rail network of Renfe. The AVE connections make Burgos easy and fast to reach from several major Spanish cities. From Madrid a trip takes 1 h 30 min and from Barcelona 3 h 30 min. Towns closer to Burgos like Valladolid and Vitoria-Gasteiz can be reached in 30 minutes, while a trip to or from Bilbao or León takes 1 hour. Transportation by private car in Burgos is not difficult. Although looking for a place to park in the city centre can be very time consuming unless you park in private car parks. Burgos has an extensive system of city buses, which you can ride for just 85 cents. You can buy the ticket on board. Walking is the best option to visit the main attractions of the city, but there are some places of interest you can take public transportation or rent a bike to get there. Bicycle is a good option for visiting all attractions of the city. Burgos has a very good bicycle lane that connects several points of the town. Also there is a bicibur public rental service for bikes. The terrain is relatively flat, and riding along the rivers or in Fuentes Blancas is an easy way to see the sights. 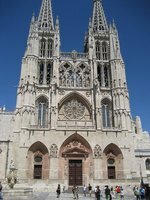 We have a comprehensive list of accommodation in Burgos searchable right here on Travellerspoint. You can use our map to quickly compare budget, mid-range or top of the range accommodation in Burgos and areas nearby. This is version 12. Last edited at 3:40 on Aug 2, 17 by sleepBot. 13 articles link to this page.